Authors: Kausar, A. K. M. G., Alam, M. J. and Awal, M. A. Authors: Khan, P., Shahrin, S., Taufique, T., Mehraj, H. & Jamal Uddin, A. F. M.
Authors: Jamal Uddin, A. F. M., Mayda, U., Shilpi, R. Y., Taufique, T. and Mehraj, H.
Authors: Nahar, M. A., Karim, M. R. and Rahman, M.
Authors: Khan, P., Mehraj, H., Taufique, T., Shiam, I. H. and Jamal Uddin, A. F. M.
Authors: Mahmood, S. M., Sultana, N., Rahman, M. M., Adan, M. J. and Chowdhury, M. S. N.
Author﻿s: Rabbani, M. A., Sarker, R. I. and Satter, M. A. Author: Hossain, M. S., Akhtar, A., Hossain, M. H., Choudhury, M. P. and Islam, F.
Author: Amin, M. M., Bhakta, S. and Das, S. K.
Authors: Islam, F., Begum, S., Majumder, A. and Hossain, M. S.
Abstract: Forty one farmers from villages of Mymensingh and Barguna districts in Bangladesh were enumerated to explore knowledge in broiler production. Data were collected on day old chick weight, live broiler weight at market age, feed consumption, mortality rate, farmers’ characters and farm management parameters. Few farmers received short training on broiler farming in Barguna (38.10%) and Mymensingh district (15%), most of the farmers did not take training. About 75% farmers in Mymensingh and 33.30% farmers in Barguna district had experiences in broiler farming for 3 years and above. Farm size was smaller in Barguna district than that of Mymensingh district. Most of the broiler farmers were rearing Ross broiler bird in Mymensingh district and Hubbard Classic strain in Barguna district. Most of the farmers had secondary level education. All broiler houses were open sided and about 85% broiler house in Mymensingh district and 85.71% in Barguna district had gable type roof made by corrugated iron sheet (CIS). In Mymensingh district, all farmers were using rice husk as litter materials but most of the farmers (95.20%) of Barguna district were using sawdust for the same purpose. All farmers in Barguna district were using the disposed litter as fertilizer though most of the farmers in Mymensingh district were using the same materials as fish feed. Farmers were using electric brooder and brooding their birds for a period of 7 days while most of the farmers were using hurricane lantern for standby power supply. During loading the day old chicks in the houses most of the farmers used oral saline, vitamin C with water in both districts. Farmers were using Newcastle and Infectious Bursal Disease vaccine for the commercial hybrid broiler birds and 100% farmers were using growth promoter for rapid gain of body weight of broiler birds in study area. Live body weight at marketing age, feed conversion ratio and mortality rate of broiler birds were 1581.58±46.08 gm, 1.84±0.07 and 5.22±0.95%, respectively in Mymensingh district. In Barguna district the same were 1502.38±35.27gm, 1.93±0.04 and 3.51±0.65%, respectively. It might be concluded from the above discussion that a) Broiler farming operation was running by secondary level educated and untrained farmers. b) Farmers were sincere in vaccination of their birds but dishonest to use of growth promoter. They were using corrugated iron sheet made roof in broiler house which could be replaced by suitable locally available materials, like straw, tree leaves etc, to protect birds from heat stress. c) FCR value and mortality rate was high. Quality feed, quality chicks, better management practices could help to increase profitability by reducing FCR value and mortality rate. Islam, F., Begum, S., Majumder, A. & Hossain, M. S. (2015). Broiler production at central and southern region of Bangladesh. Journal of Bioscience and Agriculture Research, 05 (02), 73-79. Islam, F., Begum, S., Majumder, A. & Hossain, M. S. “Broiler production at central and southern region of Bangladesh.” Journal of Bioscience and Agriculture Research, 05.02 (2015): 73-79. Islam, F., Begum, S., Majumder, A. & Hossain, M. S. “Broiler production at central and southern region of Bangladesh.” Journal of Bioscience and Agriculture Research, 05, no. 02 (2015): 73-79. Authors: Islam, S. A., Miah, M. A. Q., Habib, M. A. and Rasul, M. G.
Abstract: Large scale coastal plantations with Sonneratia apetala have been established by the Forest Department along the coastline of Bangladesh since 1966. A study was conducted to assess the present stocking and growth performance of this species and status of naturally regenerated mangrove species inside S. apetala plantations. The study was carried out from 17-42 years old S. apetala stands at 20 small islands (chars) of 4 major locations namely Rangabali (Patuakhali), Char Kukri-Mukri (Bhola), Sitakundu (Chittagong) and Hatiya (Noakhali) of Bangladesh. The data on tree density, height and diameter were recorded from originally planted S. apetala plantations. The data on naturally regenerated mangrove species (seedlings, saplings, poles and trees) were also counted from afforested S. apetala plantations. The density of afforested S. apetala per hectare area was ranged between 311-2178 trees, tree height ranged between 6.37-20.66m and diameter at breast height (dbh) ranged between 17.32-34.02cm at different chars. Totals of 6, 9, 6 and 1 different regenerated mangrove species were found to occur naturally inside S, apetala plantations at Rangabali, Char Kukri-Mukri, Sitakundu and Hatiya sites respectively. The most abundant regenerated species was Excoecaria agallocha in all sites. Others important species were Heritiera fomes, Avicennia officinalis, Bruguiera sexangula at Rangabali; Aegiceras corniculatum, A. officinalis, H. fomes, Phoenix paludosa at Char Kukri-Mukri and Ceriops decandra, A. corniculatum, Tamarix indica, A. officinalis at Sitakundu site. This natural regeneration could be a second rotation multi-storied sustainable mangrove forest in the coastal belt of Bangladesh. Islam, S. A., Miah, M. A. Q., Habib, M. A. & Rasul, M. G. (2015). Regeneration diversity of mangrove species inside Sonneratia apetala plantations along the coastal belt of Bangladesh. 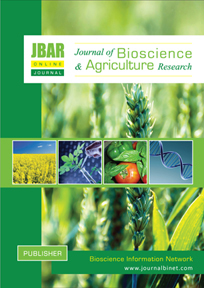 Journal of Bioscience and Agriculture Research, 05 (02), 80-87. Islam, S. A., Miah, M. A. Q., Habib, M. A. & Rasul, M. G. “Regeneration diversity of mangrove species inside Sonneratia apetala plantations along the coastal belt of Bangladesh.” Journal of Bioscience and Agriculture Research, 05.02 (2015): 80-87. Islam, S. A., Miah, M. A. Q., Habib, M. A. & Rasul, M. G. “Regeneration diversity of mangrove species inside Sonneratia apetala plantations along the coastal belt of Bangladesh.” Journal of Bioscience and Agriculture Research, 05, no. 02 (2015): 80-87.